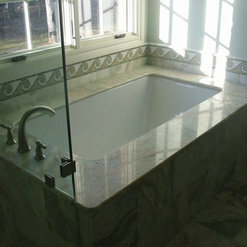 We offer a range of services from interior design to home additions. Depending on the services you are in need of our designers range from $50 - $175 per billable hour. We pride ourselves in transparency to the client. As a professional, I would not recommend Chris and his team. 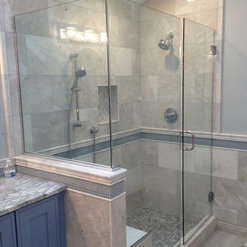 We worked together on a master bath project and his team did not show up as scheduled, his communications was lacking as I had to reach out to check when his crew was working & I received vague answers such as “later this week”, his tile installer sawed through plumbing pipes that leaked and ruined the kitchen ceiling and wasn’t fixed for a month, the shower tile had to be re-done as it wasn’t installed symmetrically, Chris as GC was seldom onsite, and after receiving final payment from clients, Chris did not pay his vendors. Be careful whom you hire! 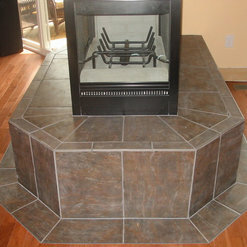 Chris and his team at Distinct Design and Construction were honest and professional. I love how the project was explained in stages and the "pay as you go". 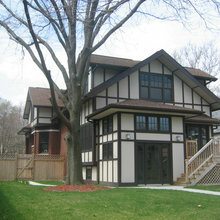 When they dug deep into the project of "this old house", they realized some of the unique problems that may arise with removing and re-supporting a load bearing wall. Chris was meticulous about letting us know the "what if's" and planned accordingly. He designed the project so that anytime, if we felt the "pain" of construction would not be worth the gain, that we could halt the project, but still keep all the signed and stamped drawings to use at a later date. I would highly recommend this company, especially for an older, historic type home. He gets the intricate and hidden issues that are inherent in homes constructed before many of the new standards. We were very impressed and Chris exceed our expectations. We liked that Chris is the owner of the company and that we got his full attention during all aspects of the project. 5 plus stars! Chris and the Distinct Design & Construction Team just finished an outdoor steps/deck project for us and we are thrilled at the outcome. 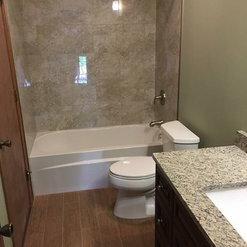 From obtaining an estimate to walking through the finished product, Chris was informative, helpful and eager to personalize each and every step of the process. The team was professional, timely and checked in daily with status updates. Each day, the job site was left clean, safe and secure. We didn’t have to lift a finger for permits or inspections. Chris and his team took care of it all, leaving us with zero stress. We will definitely use Distinct Design & Construction again for future projects and are already recommending them to friends and family. 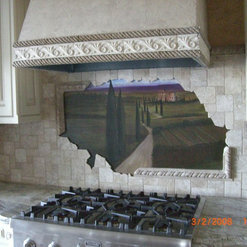 Had Distinct Design do an upgrade on my kitchen. CJ was very helpful and accommodating to what I needed and my price range. CJ and the team he brought in did a great job. I had just bought a house and needed an upgrade to my kitchen. He made an appointment to take some pre-measurements and pictures and within a day came up with an idea. Trusted my gut and trusted him. 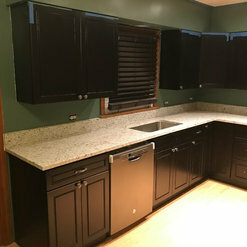 All I had to do was pick my cabinets and counter top and CJ and his crew did the rest. They were professional, and quick. Constantly got email updates to let me know what was going on. There are some other upgrades and remodels that I'm gonna need and will definitely use Distinct Design again. You were a pleasure to work with Charles! Thanks for trusting us with your new home, and we look forward to collaborating again in the future. 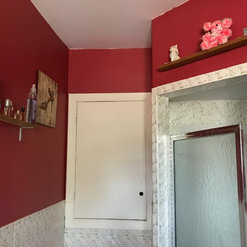 Our bathroom has had a complete makeover and I couldn’t be more impressed on the outcome, Distinct Design & Construction, located in Downer’s Grove, IL. has done a wonderful job and we could not be more pleased. When I first spoke to the owner, Chris Velguth, he was very helpful and informative. I didn’t feel so lost anymore on how to even begin the process. The most important thing to me was communication throughout the whole process and I can tell you that was his STRONG POINT. I received daily updates and any questions I had were answered promptly and efficiently. The guys cleaned up after themselves each day and unloaded all the garbage, I did not have to lift a finger. 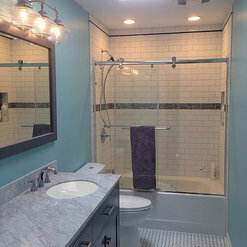 Bathroom turned out as beautiful as we expected the guys were professional, courteous, organized and completed the project in a timely fashion, we are extremely happy and I have already recommended their services to others. Thank you so much for the kind review Lori. 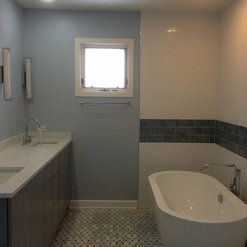 I really enjoyed working with you on your bathroom, I hope to have the opportunity to work together again! 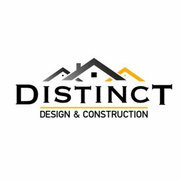 Distinct Design and Construction is the most comprehensive firm we have ever worked with. Starting with the meticulous design of our new kitchen, they have engaged with us on every aspect of planning. The process of completely re-imagining a new space has been managed with every detail and specification being reviewed. With our vision as the primary focus, DD and C has provided suggestions for saving time and money before starting the project. They are organized, friendly, and professional. 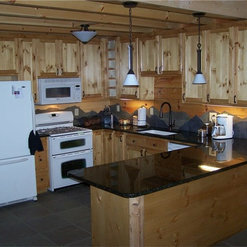 Additional Comments after project completion: We are extremely happy with our beautiful new kitchen! Take a look at the picture I posted and you'll see why. 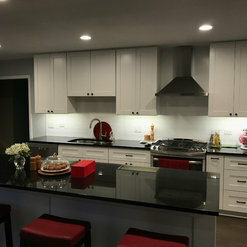 This project was managed literally from floor to ceiling with precision and professionalism by Chris Velguth at Distinct Design & Construction. The entire crew from DD and C delivered the highest quality work from start to finish. I highly recommend Chris and his firm. Larry, Thank you for the kind words! 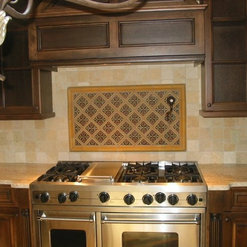 It has been a pleasure working with you and Barb on the design and planning of your kitchen.